iHome has released a major upgrade for its iHome+Sleep app, turning it into a full-fledged universal app, and giving it a design overhaul. iHome+Sleep is a free alarm clock app that lets you define multiple sets of bedtime and wakeup settings such as alarms, wake and sleep music, social updates, personal reminders, and more. iHome+Sleep can also be used in conjunction with iHome’s App-Enhanced line of docking devices, led by the iHome iA5. New in iHome+Sleep 2.0 is the app’s ability to run universally on the iPad, iPhone, and iPod Touch. It’s also received a total design refresh, complete with simpler navigation system, revamped interface, and Retina display graphics. When running on iOS 4, the app now supports background alarms, and support for iHome’s new app-enhanced iA100 alarm clock has also been added. 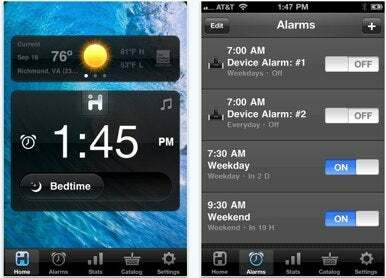 iHome+Sleep 2.0 requires iOS 3.2 or later.